So we are finally getting ready to start thinking about the outside of the house, and just in time. The gutters have fallen off one side of the house, there are lots of little nicks and holes all over the house, the paint has come off, there are lots of cracks in the current/board siding, and even some of the siding is coming down. All that stuff is not going to fix itself. We've had three (well, four people come out) to give us quotes on fibre cement and also on vinyl siding. Nearly everybody that we've talked to has said that vinyl siding is the way to go. Cheaper, easier to install, and easier to maintain. Not quite convinced yet, but based on the quotes so far that's the way we might have to go. So far we can't quite afford ANY of the quotes (well, we got one that was 10K cheaper than two of the other guys, but we didn't actually meet him. He blew off the appointment, and then sent an email saying "I couldn't find a place to park, and I have a bum leg" and then proceeded to give us a quote WITHOUT ASKING US WHAT WE WANT. From my perspective, that guy could PAY US to side the house, and we still wouldn't go with him. We're still waiting on one quote, and meanwhile we have to have a serious look at our finances and see how in the hell we can afford this. We can't afford to not protect the house, but we can't afford to protect it either. 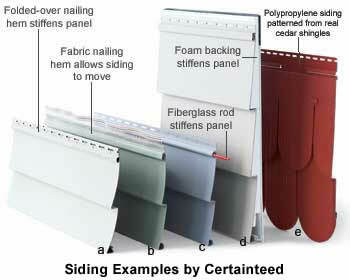 Anybody out there done vinyl siding? Anything to watch out for? Comments on "The Outside of the House"
My father used to install siding (asbestos, insulbrick, etc.) back in the old days and the one thing he always told me was that the installer should make it look straight above and below the windows no matter how out of level the house or the windows were. I have to agree with that as I've seen a lot of siding since then (aluminum or vinyl) where it was crooked under the windows and it always made the house look worse.